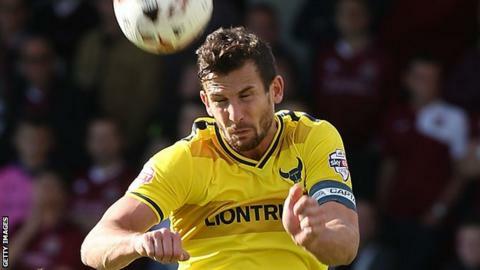 Oxford United are set to be without captain Jake Wright for the first time this season as the defender recovers from a back spasm. The 29-year-old has not trained since suffering the injury during the home defeat against Barnet on Saturday. Manager Michael Appleton is likely to give Chey Dunkley a start in Wright's absence for the trip to Stevenage. "Chey's been patient. He's had to wait for his chance through loss of form or injury," he told BBC Radio Oxford. "But he's been managed in the right way and told that when he gets his opportunity I've got no issues whatsoever with him being reliable and doing a good job for us." Appleton is excited by the chance to see the difference Dunkley, 23, will bring to his side despite the former Kidderminster trainee's poor disciplinary record. "The one thing that does go against him is the fact that he's such a big lad and he's competitive, sometimes referees think it's easy to give him a yellow card," he said. "I think he's only played in three-and-a-half games and he's got four bookings. "To be honest with you, I've not seen him make a tackle yet, so I can't really fathom that. "That's something he and I are mindful of."